While starting an online shopping store you have to decide ecommerce platform which will be used to develop your store. The decision is important as it plays a critical role in design of your webstore, its accessibility, features available to you for updates, and overall sales from your online shopping store. "WORDPRESS vs SHOPIFY: Comparison for online shopping store", lets discuss under this topic the pros and cons of both the platforms. There are a number of popular ecommerce platforms available in the market including Magento, Volusion, Big Commerce, Wordpress, Shopify and others. WORDPRESS vs SHOPIFY: We analyzed and compared Wordpress and Shopify in all the possible aspects to help you choose between them. Ease of Use – which one is faster? Shopify is one of the fastest ecommerce platforms supported by a strong back-end team. Your online shopping store developed on shopify’s ecommerce platform will load faster as compared to any other webstore. Customers give special attention to the speed of running a website as quick loading website save their time and energy. Wordpress ecommerce platform or Woocommerce require a well coded website to stand in competition with Shopify on the ground of speed. Therefore, while using a self-hosted ecommerce platform base for your online shopping store requires a qualified and experienced web designer. Enthusiastic and committed web designer can keep a check that your online shopping store is working at its peak potential level at all times. While starting a small online shopping store, budget plays an essential role in decision of spending on resources. 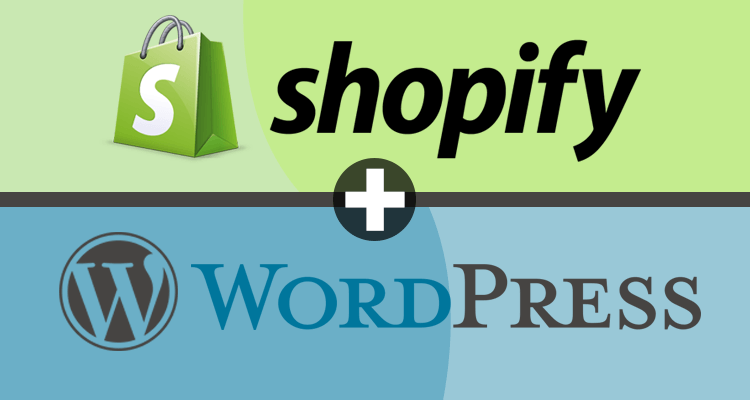 Though Shopify wins over Wordpress in speed, its charges lose out to Wordpress balancing the game. After developing your online shopping store with Wordpress you can sell as many products as you want with no transaction charges. Wordpress creates an attractive banner with “Free” flashing over it. Shopify charges monthly charges for operating your online shopping store and a commission on every transaction. Additionally, if your transactions are done from credit cards, there is an extra fee charged on it. Wordpress website might not give your customers the fastest loading online shopping store but it will boost your profits avoiding shopify’s fees. Wordpress online shopping store is easy to customize. You can add new buttons, customize looks and create a better experience for your ecommerce visitors. On the other hand, Shopify’s ecommerce platform comes customized which is difficult to modify. Shopify looks good as it comes but for re-arranging, editions, or any kind of change on the website you need complex coding. While Wordpress is the best ecommerce platform compared to any other leading ecommerce platforms for easy Customization. Really where WooCommerce and WordPress are going to excel is going to be with exposure in untapped markets. If you are selling a product locally and simply need a landing place to sell your products, having your presence online might be enough to gain local sales. But what if you want to sell to a market that doesn’t know your offering exists? Well, you do that with blogging and being the online authority on the subject. You do it with keywords. This is where the experience of having a fully charged blog platform in WordPress is going to give you a major advantage over Shopify and the rest of the competition. Content marketing attracts and engages customers on your online shopping store to learn and explore with an intention to inflict buying behavior in visitors. It is one of the best marketing strategies which has a long lasting effect. If you are a small business owner with extra disposable income and/or less time to devote to creating a website, it might be a better option to go with Shopify. Additionally, Shopify might be the better option for local businesses that are not looking to expand their services beyond their surrounding market. But if you have a custom integration that you need to get your business to work and are on a smaller budget, you will want to take a look at WooCommerce and WordPress as your option of choice. For gaining notoriety among people that are looking for your solution, the SEO options cannot be beat by the WordPress and WooCommerce tools.